​​Insect-plant interactions, chemosensory evolution, behavior, genetics & genomics. Growing up in an urban area of New Jersey, I was attracted to small creeks and abandoned lots with a curiosity to learn what was able to flourish in urban ecosystems, and I found beauty even in neglected places. 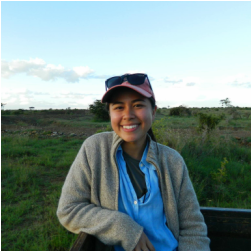 As an undergraduate at Harvard, I was thrilled with the seemingly endless opportunities to expand my understanding of organisms, ecosystems, and evolutionary theories, and to travel across the globe to places rich in biodiversity, from Costa Rica and Mexico to Kenya and Australia. After graduating, I was hired as a research assistant in the Pierce Lab at Harvard, where I worked on research projects that included: investigating chemical communication between acacias and their symbiotic ant partners; studying the effects of different ant species on myrmecophilous arthropod communities; and looking into the potentially manipulative chemical exchange between lycaenid caterpillars and their ant associates. For a year, I was also involved in digitizing the Ant Collections of the Harvard Museum of Comparative Zoology, followed by a year working at an agricultural biotech start-up in Boston, Indigo Agriculture, where I helped in the development and production of bacterial and fungal seed coats to increase crop yields. Here at UC Berkeley, I find myself again searching the small creek running through campus, searching now for herbivorous drosophilids and their near relatives. I am interested in understanding how the sensory systems of these insects have evolved and enabled previously microbe-feeding insects to detect and accept living plants as a new food source. I have a specific focus on gustatory systems, and using comparative genomics, functional genetics, and behavioral experimentation to unravel the evolution of peripheral chemosensory proteins.